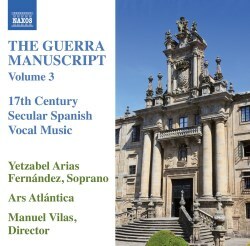 This is the third volume in a complete recording of a collection of Spanish songs from the 17th century, known as the Guerra manuscript. The name is derived from José Miguel de Guerra (1646-1722), scribe of the Royal Chapel from 1677 to shortly after 1680. It is likely that the manuscript was copied around 1680. The quality of the paper and the precision with which the music was written suggests that it was destined for royal or aristocratic circles. All the songs are anonymous, but through a comparison with other sources the composers of a number of songs can be identified. It turns out that most of the main composers of secular songs of the 17th century are represented. The collection includes 100 songs, all but two for solo voice and basso continuo. Some were written as independent pieces, others were originally part of theatrical works. Juan Hidalgo, for instance, is generally considered the greatest Spanish composer of music for the theatre of the 17th century. In New Grove his status is compared to that of Jean-Baptiste Lully in France. José Marín was a singer by profession and especially famous for his tonos, as these songs are generally called. In previous volumes (Volume 2 review) the singer supported only by harp and/or guitar. In this third volume the number of instruments has been extended by a viol and a theorbo, and some of the songs are connected to an instrumental piece by other composers. In the liner-notes José Ángel Vilas Rodríguez pays special attention to this particular aspect of performance practice. He points out that in the baroque era it was the responsibility of the performers to bring compositions to life through their own personal interpretation. “At times, therefore, achieving a satisfactory musical rendering might have been more important than other considerations, such as, for example, paying strict attention to the written version, or to a work's integrity, or to keeping it quite separate from any other piece of music”. This is why the performers have included instrumental pieces, either as an introduction to a song or even as a ritornello. The latter is the case, for instance, with the Sonata cromatica by the Italian composer Tarquinio Merula. Part of it precedes Desmayado el aliento by Juan del Vado, and it continues before the closing refrain. Even if one accepts the arguments for this practice, the choice of this particular piece and the way it is used is not really convincing. Obviously performers at the time could only use pieces they knew. Question is: was Merula's music known in Spain? The other issue is that the playing of a part of this piece between the last stanza and the closing refrain damages the unity of the piece. At least that is how I experienced it. That said, the character of Merula's piece matches that of Vado's song which is one of the most brilliant and expressive pieces of this disc. The refrain (estribillo) which usually opens a song, includes some strong dissonants on the word ‘dolor’ (pain). This song is of the same quality as the best of what was written in Italy at the time, especially in regard to the way the text is translated into music. Another impressive example of text expression is Pues así mis cuidados by José Marín. Hidalgo's De las luces que en el mar is also a gem, and I was especially struck by the expression of the refrain: "Alas, what misfortune, but, ah, what flattery, to die of a sorrow that seems such bliss". It is performed with great subtlety by Yetzabel Arias Fernández. She is of Cuban birth and therefore a native Spanish speaker. That greatly helps to deliver an idiomatic interpretation. She has a great feeling for these songs, and she sings them with passion. She has a beautiful, warm and agile voice which perfectly suits this repertoire. She is aptly supported by the instrumentalist who give fine performances of the instrumental items. I was impressed with the two first volumes, both in regard to the repertoire and the performances. I have enjoyed this third volume just as much as the previous ones and am looking forward to the next instalment of this project.